The web is changing. I know you’ve heard this before and quite frankly you will hear it a great many times again in your lifetime. But we can quantify this change in ways that were simply not possible in the past. Change on the web is usually associated with functionality, volume, velocity, or agility. In other words, the attributes which determine the structure, growth and interactivity of the web. This time, however, the change is different. Rather than impacting on any of these usual attributes, the change is actually born of them and the reason for that is that this change, this time, goes to the very core of what makes the web useable, namely, search itself. Search is crucial to the value of the web. Why? Because it is the way we navigate the massive amount of information that gets placed on it. Search also is the quality that adds meaning to the attributes that will determine the growth and development of the web. Imagine, how could the web grow and develop without search? Suddenly the world within worlds of interconnected information, the huge expansion of every possible kind of stored knowledge and increased functionality would have no meaning or impact upon anyone beyond the lucky few to stumble across a website or a directory or a collection of stored knowledge that happened to be what they were looking for. Indeed, they would be feeling quite lucky since the size of that data cannot even be measured! 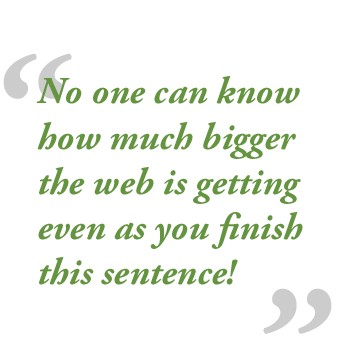 As I add the 20 megabytes of this article onto the web, the size of the web expands: no one can know how much bigger the web is getting even as you finish this sentence! Search is what saves the day. It allows you to navigate this constantly expanding universe in real time. Literally, the day this Journal article is posted, it becomes searchable to someone on the other side of the world. 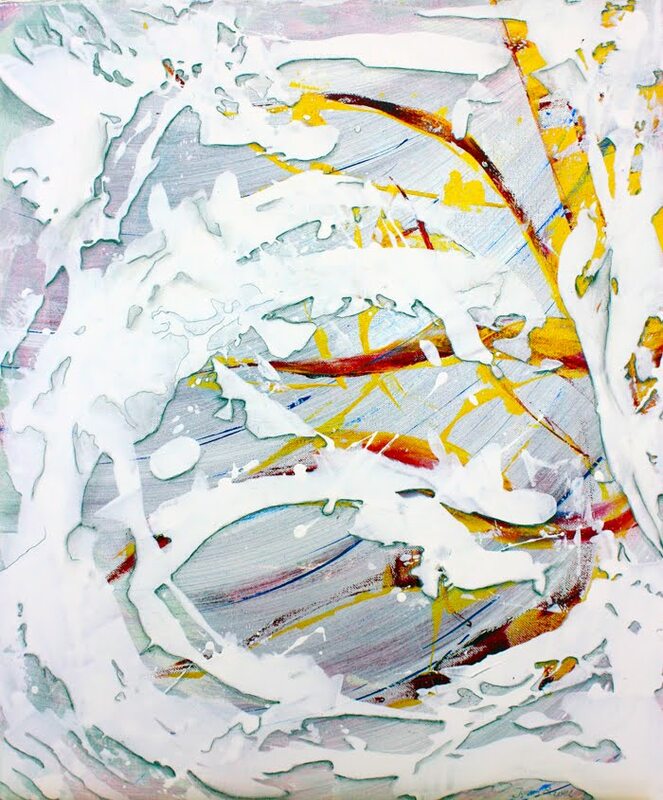 Moreover, it then creates meaning out of the chaos. You of course know what you are looking for because you are thinking about a particular subject. Being able to find that information (and quickly, before you forget your train of thought) allows the web to acquire a shape that makes immediate, mindful, sense. Great search adds instant value to what is being uploaded on the web. You can be connected to just the particular fact––just the particular person––just the very item you want––that someone else is (or has been) writing about, thinking about, analyzing or uploading to the web in real time. Your thoughts can be connected to those thoughts to create new webs of thought (also then searchable by yet another person). Because of great search, this can all happen faster than the human brain can have a single thought (approximately 20 million billion calculations per second). Wow! And search is changing so that it’s even more accurate, and can find what you are looking for even faster. How is it doing this? Paradoxically, search is working better and faster by becoming more human. It is no accident that the very word ‘Semantic’ comes from a Greek root meaning having meaning or making sense. The kind of search we have now––sequential/Boolean search––is losing its power the more there is of the web to find. The reason this is happening is because of similarity of content that arises out of coincidence (sometimes), design, or, outright plagiarism. It can be compared to using a flashlight in your backyard at night: things are fine––even if two things look relatively similar––until your backyard becomes the size of the State of New York! To find what you are looking for on today’s web takes on the proportions of an ancient Greek myth: perhaps like the story of the Labyrinth. In that story, Daedalus made a maze so complicated that he almost couldn’t find his own way out! Semantic Search takes care of all this by analyzing not only the statistical probability of content based on keywords and keyword density, but by understanding the very meaning and value of each document that’s on the web in direct relation to our search query. 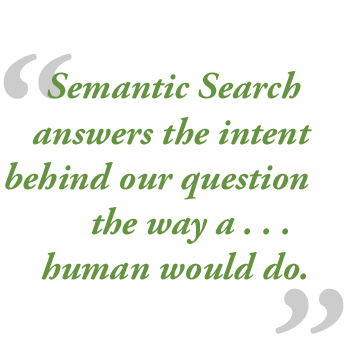 In other words Semantic Search answers the intent behind our question the way a super-smart human would do. Or, for that matter, maybe not someone super-smart, but at least human: a child knows the difference between tears of rage and tears that create little piles of torn paper. Semantic Search can use context as well as content and it is already increasing the speed of your search behind the scenes right now. Right now Semantic Search is at a nascent stage. The amount of information that is required in order to create a truly semantic web is staggering and even more staggering is the taxonomy (a way to group things together) that is classically associated with the indexing of such information. Nevertheless, this is the only way to go if we are to continue to derive useful meaning from the mounting data that is being added to the web. Because data acquires real meaning when it interacts with the Semantic web, data derives some of its filtering from the social signal of the human interactions surrounding the data content. Social signals are how human beings understand meaning: a phone call from your wife has a different “social signal” than a phone call, say, from a stranger selling something. This addition of social signal creates a two-way street where data is constantly being created, shared and curated as a means of defining our digital identity, while we are also frequently being defined by the data we use; all of it being constantly re-connected back and forth to our social interactions. In that sense the impact of Semantic Search acquires a kind of philosophical value. It not only helps shape the meaning of the digital world that we discover through data, but it also becomes part of the image of the world––and the meaning of our place in the world––that we form as a result of the data we discover. Ultimately Semantic Search helps provide meaning not just to the things we are looking to find on the web but also to the much more substantial and harder to solve questions of who we are, what we do, why we do it, and who we do it with. And it does it all through the seemingly simple action of … search. David Amerland is the author of The Social Media Mind and the best-selling SEO Help, Online Marketing Help and Brilliant SEO. He is currently working on the new book, Semantic Search and SEO which will be published in April 2013. His articles and books on online marketing, SEO and the social media revolution have helped thousands of entrepreneurs build successful online businesses. When he is not busy writing, he advises companies and start-ups on social media strategy, and gives talks about the social media revolution. He maintains his own blog at http://helpmyseo.com where you can find practical SEO and social media advice; and spends more time online than is probably healthy. You can follow him on G+ or @davidamerland.